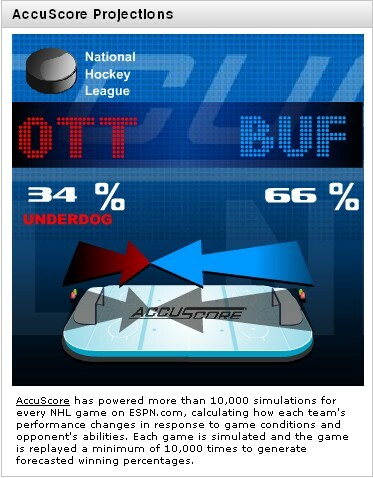 Sens @ Sabres - 11-11-11: Who wins? This is the 2nd meeting between the division rivals. The last meeting saw the Sabres win in a shootout 3-2, in Ottawa, on November 5. Derek Roy scored the winning shootout goal for the Sabres. Roy and Jordan Leopold scored in regulation for the Sabres, and Condra and Michalek for the Sens. Anderson made 31 saves compared to Enroth's 25. It appears as though Jhonas Enroth will make his 2nd start vs. the Sens this year, and Anderson will start for Ottawa. The Senators have lost 4 straight games. They are 3rd in the Northeast and 10th in the conference. Their last game came on Wednesday, a 3-2 loss to the Rangers at home. Captain Daniel Alfredsson is expected to return to the line-up for the first time since suffering a concussion Oct. 29 vs. the Rangers. Chris Neil is listed on the IR after suffering an ankle injury but was listed as in the line-up as of Nov. 10. Daniel Alfredsson has 81 points (41-40) in 80 career games vs. the Sabres. Milan Michalek has 6 points (4-2) in 14 games vs. Buffalo. The Sabres have won 3 straight games. They are 2nd in the Northeast and 7th in the East. Their last game was a 6-5 win over the Jets on Tuesday. Patrick Kaleta is not in the line-up after being eligible to return as of yesterday, after serving a four game suspension for an illegal hit to the head. Thomas Vanek 33 points (19-14) in 42 games vs. the Sens, with 8 of his goals coming on the PP. He had 2 goals in the 6-5 win over Winnipeg. Pominville has 24 points (9-15) in 38 games vs. Ottawa. He had a goal and 2 assists vs. Winnipeg. Don't forget Chris Neil -- out for the next two games with an ankle injury. Is it confirmed? I went by the Dailyfaceoff lines which had him listed in the line-up as of Nov. 10. I suppose Winchester would replace him somewhere? Dash wrote: Is it confirmed? I went by the Dailyfaceoff lines which had him listed in the line-up as of Nov. 10. Pretty safe bet since he's a regular in the lineup. Bet the deed on Ruffalo! Spezza has 13 goals and 13 assists in a 12-game point streak playing in Buffalo. Say all you want about our defense, but Anderson has to do better than third-worst in the list of the 30 goalies with the most games played (the only goalies sporting a worse SV% that Anderson's .886 are Halak at .882 and Mason at .866. Neil out, Alfredsson in. Those are the only lineup changes. Of course it's not a straight substitution, since Alfredsson will play on the second line and Neil on the third, which pushes Butler all the way down to the fourth. 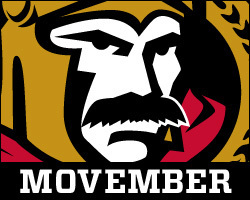 Go Sens...an opportunity to clean up some of the giveaways and score on young Enroth - if that's who's starting. Ian Sendes thinks that's the case. No confirmation though. 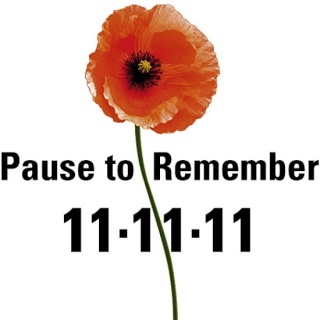 Lest we forget... pay your respects today and every day... cherish your freedom. It's looking like Enroth will go for the Slugs. shabbs wrote: It's looking like Enroth will go for the Slugs. Balls. I have Miller in my pool. I would have really preferred a Buffalo shutout will Miller in nets. I would prefer lighting Enroth up like an X-Mas tree, then Miller gets brought in and we score another 12 on him too. Just for you. SpezDispenser wrote: I would prefer lighting Enroth up like an X-Mas tree, then Miller gets brought in and we score another 12 on him too. Just for you.